The last time they sold these skates the price was $15,000, which would be extravagant if they were just any skates, which they’re not, obviously, because who would pay so much for skates? It’s not as though it’s even the full skate package we’re talking about here, either, these are just the blades for sale, detached blades, no boots, bootless, so if you were going to be buying them for the backyard rink this winter, you’d have to be buying boots separately, at further cost, and also paying somebody to bolt them together. Not that you’d do that. Why would you? These are blades that belonged to Howie Morenz, which means they’re not for skating so much as for — that’s the big question. What would you do with these famous blades of skates that you bought? I guess you could display them on your dining-room sideboard. You could carry them with you in your briefcase to show clients. Christmas presents for the children? You have a day to think about it. The big Fall 2011 sale at Classic Auctions ends on Tuesday night, November 1, so there’s still time to prepare your bid. More than 1,000 items are up for grabs, including Bill Barilko’s autograph, Dominik Hasek’s pants, and Garry Galley’s New York Islanders’ equipment bag with certificate of authenticity and (I’m assuming) the rich reek of professional dressing-rooms past still on it. The bidding on Sidney Crosby’s 2005-06 Black Sherwood Momentum Game-Used Stick (Lot# 506) is up to $1,264 at this hour. Wayne Gretzky’s 1980s Personal Wool Sports Cardigan (#514) is holding at $242, though if that’s the direction you’re going in, let me say this: just because Gretzky could get away with bulky knitwear stylings in grey and claret and oatmealy shades doesn’t necessarily mean that you can. Classic Auctions, if you didn’t already know, is the eBay of all hockey-related artifacts, from the rarest of trading cards to the most desirable of pucks, with every manner of famous sweater, stick, trophy, and one-of-kind hockey keepsake and oddment in between. Based in Delson, Quebec, just south of Montreal, they’ve been in the business since 1995. Maybe you’ll recall last year when Paul Henderson’s glorious 1972 Soviet-beating number 19 sweater sold for $1,067,538: Classic Auctions. Having sold in sales gone by both Teeder Kennedy’s (winning bid = $1,515) and Yvan Cournoyer’s ($1,412), Classic also has the market for partial hockey-player dental plates pretty well wrapped up. Global economic panic doesn’t affect the hockey-auction market, according to Marc Juteau, Classic’s president. Doesn’t matter what’s happening in the EuroZone, or how housing starts are looking this month: come what may, people want their 1972 Canada-Russia Series Russian Nesting Russian Dolls (Lot# 607). The big ticket this time is Bobby Orr’s white number 4 sweater from the 1976 Canada Cup. As of today, the bidding is up to $45,960. I’m not really surprised by how much people are willing to pay for shrouds of the Turin Olympics ($711 for Brad Richards’ sweater this past June), or pieces of true cross-bar ($1,100, also in June, for the net from Joe Louis Arena into which Luc Robitaille scored his 611th goal, Which Broke Bobby Hull’s NHL Record For Left Wingers) — one of the revelations of the Classic catalogue is how much hockey swag is out there in the way of diamond rings and golden medals, 14-karat pins, coins, All-Star charms, silver spoons and ice buckets, teapots and sugar bowls inscribed in tribute to Jean Béliveau. Hockey’s ingredients are all-natural, we like to think, ice, wood, rubber, and steel brewed up with best Canadian grit, but there are plenty of precious metals mixed in there, too. Right now the going price for Howie Morenz’s CCMs is $3,328. They’re size ten-and-a-halfs, if you’re wondering, and hand-made. The Hockey Hall of Fame had them for a while, once. At some point they sold in the United States for $25,000. I don’t know the circumstances, but that didn’t stick, and back out on the market they went in 2004. They’re more beautiful than Béliveau’s tea service — I think that’s fair to say. They look like they belong in a red plush-lined case with somebody’s best polished carving knives. I’m not going to called them cursed, but when Classic auctioned them off last time, the listing for Item #446 was the almost-palindrome Howie Morenz Last Game Worn Skates – the Skates that Killed Howie Morenz. That’s a little harsh and a heavy burden to carry, I suspect, even for skates. 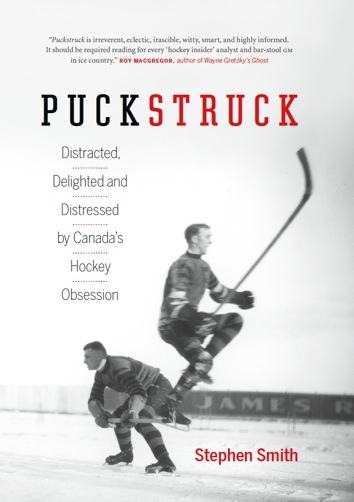 Still, pinning the death on the skates is in keeping with the whole Morenz tragic myth about hockey having killed him at St. Luke’s Hospital in 1937 rather than blood clots. If it were me, for my money — I don’t know. As much as Morenz interests me, I don’t covet his death-skates. Nor, in that morbid line, will I be going after Lot# 602 tomorrow night: the black vinyl Automobile Document Holder “retrieved from the wreckage following the car crash in August of 1982 that took Valeri Kharlamov’s life.” (If you’re interested, $334 will get you in on the action.) On price and winter warmth, Lot# 991 looks like a better option than Gretzky’s cardigan: Maurice Richard’s $152 Montreal Canadiens ski jacket. In the end, though, any serious look I’d take would have to start over at Lot# 161. They’re big, 12”, and they’re heavy, 13 lbs. each one, and I think it’s the industrial gizmo charm that attracts me to Chicago Stadium Brass Gauges Collection of 5 more than their glamorous provenance, which goes back to the physical plant at the old Chicago rink in the 1920s. I don’t really know why I wouldn’t be bidding on them, knowing that for somewhere in around $200, I could be walking away with the original indicators for Boiler Pressure, Heating System, Compressed Air, Vacuum Return, and Brine System. Clarence Campbell’s riot-seat is here, and kind of enticing, too — or, sorry, Clarence Campbell’s Montreal Forum Red Seat. 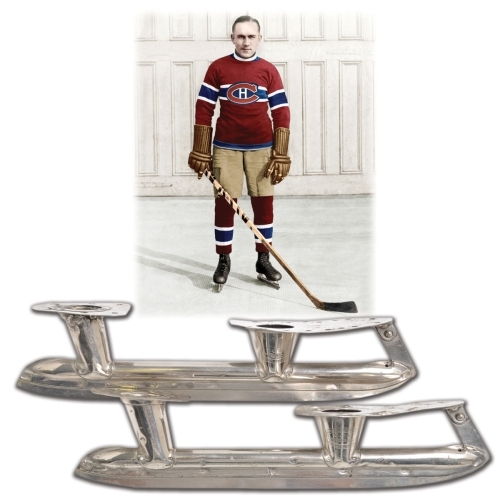 Based on the Morenz skates, you’d think the better way to market Lot# 45 would be as The Seat That Incited Montreal To Riot. Because, of course, it’s where the NHL President always sat when he went to watch the Canadiens play at the old Forum, B20, in the reds. It’s where he was on the night of St. Patrick’s Day, 1955, March 17, with his secretary (and future wife) Phyllis King beside him, though probably he should have given the seats away that night, having incurred the wrath of Montrealers by suspending their beloved Rocket Richard after he, Richard, had punched linesman Cliff Thompson earlier that week. Would there have been a riot if Campbell hadn’t taken this seat that night? Maybe, maybe not. Without it, would B20 have sold for $12,000 when the Forum closed in 1996? You have to think that a good part of that price was Richard-Riot value. Although, bidding is at just $1,735 today — so I don’t know what that says. Whoever bought the seat back then went to the trouble of having Campbell’s portrait painted on the seat-back. It’s a good likeness, too, in black and white, of how he might have appeared that night in 1955, before a man by the name of Andrew Robinson hit him with a ripe tomato and all hell broke loose.